Ted and I spent over an hour grocery shopping this past weekend. What we thought was going to be a quick trip [list and all] turned out to be a long trip for two reasons: Joey and Anthony. Note to self: grocery shopping is never fast with two babies and one husband. Anyhow, we conquered and divided the kids and the list, but somehow ended up coming home with 11 bananas. Knowing that we’d have some super ripe bananas by mid-week, I knew I had to act fast— there’s only so many bananas we can eat in smoothies, pancakes, oatmeal, etc. So I went where my head and stomach goes when I eat a banana: chocolate. And voila, my hybrid of the two [not really, but similar concepts + flavors]…. 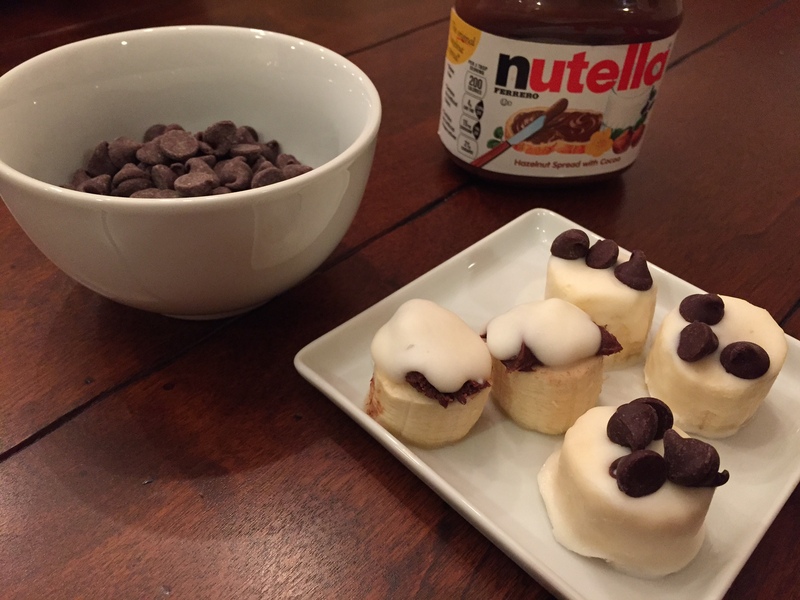 These were SO easy to make and definitely helped to hit the sweet tooth craving I have after EVERY meal. Yep, every meal. And call me crazy but cold temps in Michigan will not sway me from enjoying a frozen sweet treat. Come rain, snow, or sunshine, I’ll eat dessert. But I think this recipe doubles as a healthy dessert and a healthy snack. And the best part is that I prevented wasting food later in the week. Can you tell I’m feeling accomplished and it’s only Tuesday! The chocolate chip bites have a better look to them, but the Nutella bites were tastiest IMO. One recommendation: do NOT eat with coffee. Or else you’ll have some pretty serious freezer burn weird sensitive cold teeth thing going on. Trust me. Oh and I forgot to mention that these are super kid-friendly. If you have big kids have them help with the prep. I tried making batch #1 with Joey’s help but he decided to use the yogurt as paint on my kitchen counter. Our budding picasso!! 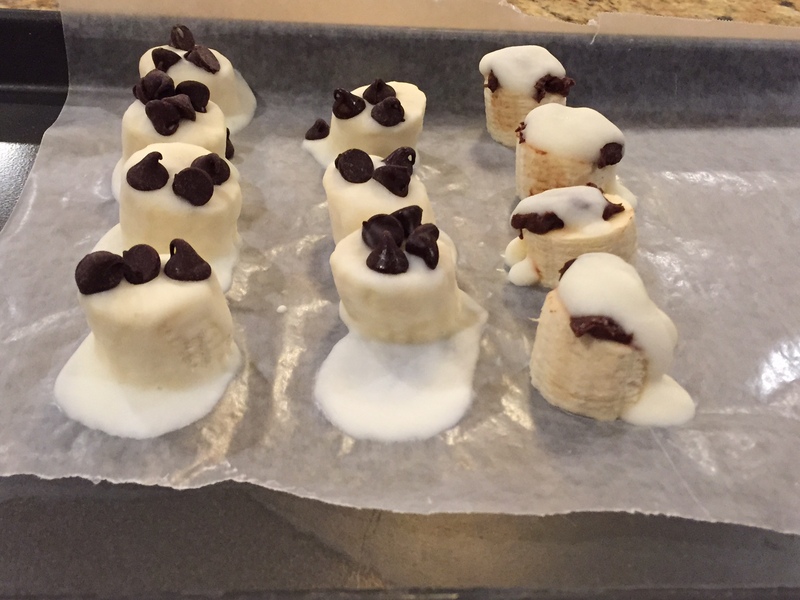 For the chocolate chip variation: Dip banana slices in yogurt, completely coating the banana. Then sprinkle the top of the banana slice with a few chocolate chips. 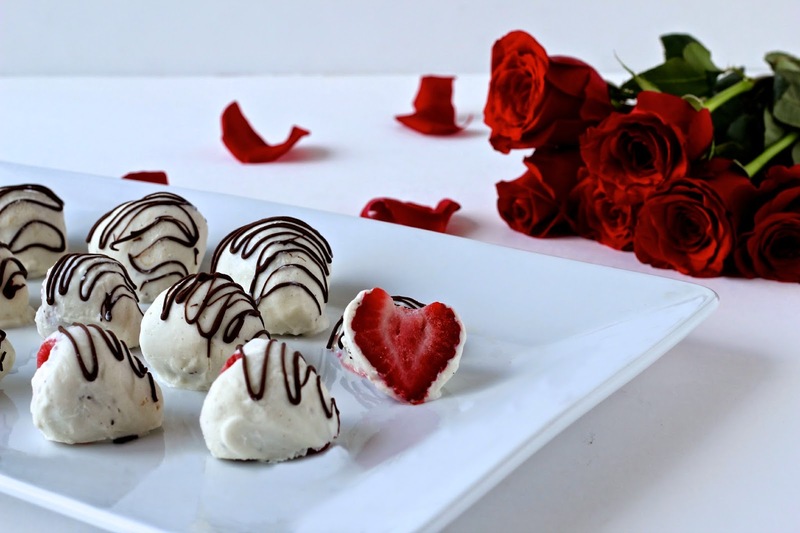 Place on a foil lined sheet and freeze for up to one hour. Sit at room temperature for 15 minutes before eating. For the Nutella variation: Spread a teaspoon of Nutella on the banana slice. Place on a foil lined sheet. Drizzle a teaspoon of yogurt over the Nutella. Freeze for up to one hour. Sit at room temperature for 15 minutes before eating. If you like this recipe, you should also try my Frozen Yogurt Covered Blueberries. Both recipes are 4-seasons approved, even though they require freezing! Thanks Shashi!!!! Ours didn’t make it one day. Good thing we have more bananas lol! Love this quick and easy snack idea! I always need just a little bit more than fruit and this fits the bill. Pinned! These look so yummy! 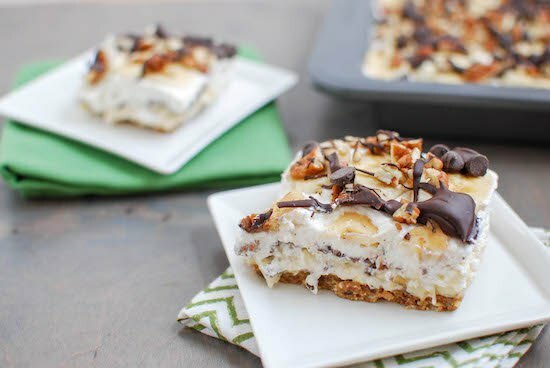 I’m always up for trying new healthy “desserts” because I have a constant sweet tooth too! looks delicious! Definitely going to try out the nutella version! Joey couldn’t get enough of the yogurt dipped berries so I had to use a different fruit lol! Ice cream is calling my name now! Always looking for a way to add a little extra protein or fat to fruit for my little CF patients in clinic- thanks! Love simple. Love these. Don’t love grocery shopping with kids. But #thatslife most days…for me anyways. (: Hang in there.